As we noted earlier this month, Captain Marvel features a Stan Lee cameo that is more reality-breaking than the average Stan Lee cameo (even the Guardians Of The Galaxy Vol. 2 one that implied every character he played was actually the same person or the Teen Titans Go! To The Movies one where he had to leave when he realized it was a DC movie). Specifically, it features a scene set in 1995 where Brie Larson’s Carol Danvers is making her way through a train, hunting for Skrulls, when she sees Stan Lee reading the script for Kevin Smith’s Mallrats—a reference to the fact that the real Stan Lee made a cameo in that movie in the real 1995. After Captain Marvel came out and Smith saw the reference to his own movie, he posted a teary-eyed photo on Instagram about how much it meant to him (plus the standard question about whether or not he survived Thanos’ snap, since he now technically exists in the MCU). 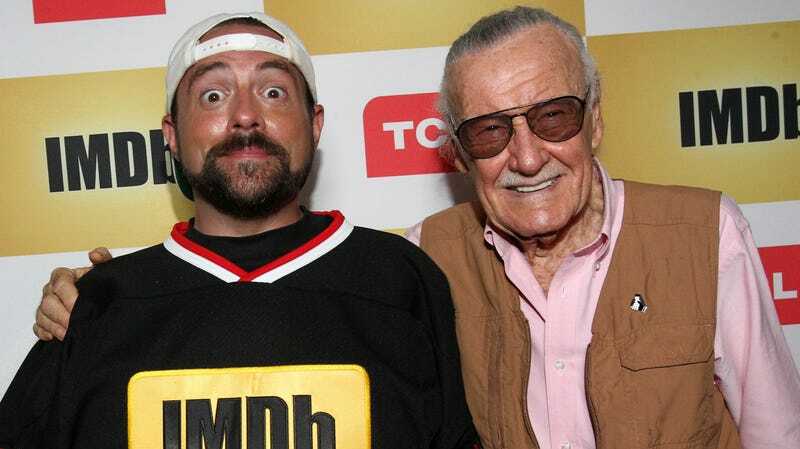 Today, Smith shared another Instagram photo that reveals he’s paying Captain Marvel back with a mini-cameo in his Jay And Silent Bob reboot movie, with Jason Lee—apparently as his Mallrats character Brodie—picking up a Captain Marvel comic and making the same sort of distractingly reverent face that Brie Larson gave to Stan Lee in her movie. It’s cameos upon cameos and references upon references, which is basically the ultimate Kevin Smith thing.